Jennie Dembowski does not host many dinner parties but her Shrimp and Cream Cheese Tartlets and Prosciutto and Date Tarts may give her a reason to entertain more. She can definitely throw a dazzling dinner party with these Hor D'Oeuvres. Her short crust pastry tarts will have a pastry topper and a bit of chive layered on top. Judge Johnny Iuzzini says the key to Jennie's recipe is getting the proportions just right. 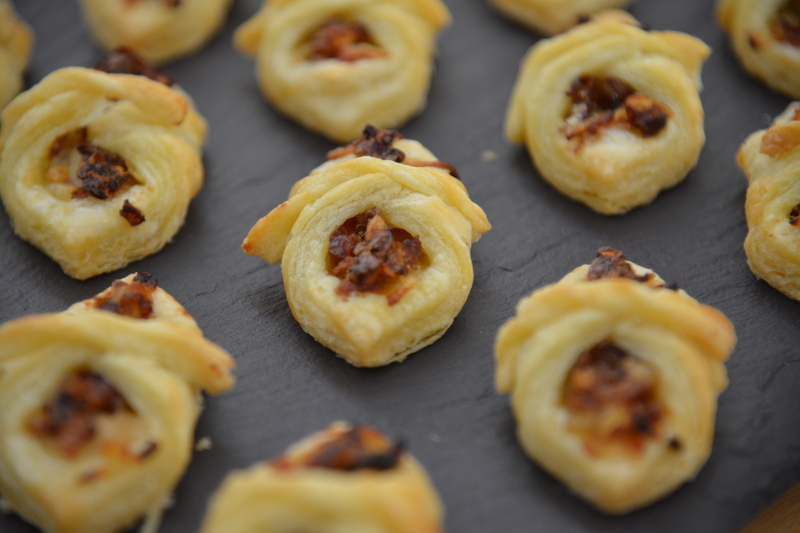 Watch the full episode of "Pies and Tarts Week" from Season 2 Episode 4 of The Great American Baking Show to find out if these Hor D'Oeuvres stand out as party must haves. 2. Prepare dough by pulsing flour, salt, sugar, chives, pepper, and garlic powder in food processor for a few seconds. Add butter and heavy cream and pulse until combined. 3. Place dough onto plastic wrap and divide into two. Place in refrigerator to rest for 20 minutes. 4. Remove from refrigerator, roll, and cut into a quantity of 18 — 2-½" circles using pastry cutter. This will be the first layer. 5. Cut 18 additional 2-½" circles then cut out center using 1-½" pastry cutter to create a "window". This will be second/top layer of pastry. Reserve small cutouts to use as pastry toppers. 6. Brush egg wash on top of first layer of pastry, then lay second layer of pastry on top and brush with more egg wash. Lay small centerpieces on separate baking sheet and brush with egg wash. Freeze both baking sheets for 15 minutes. 7. Bake at 400º F for 15-20 minutes for small pieces and 20-25 minutes for large pieces or until golden brown on top. Remove smaller pastry toppers sooner if needed. 8. Cook shrimp in olive oil and butter. Dice into small pieces. 9. Make the cream cheese filling by whisking softened cream cheese, butter, salt, pepper, and garlic together. Cut chives into approximately 1" long strips. Tweak salt, pepper, and garlic portions to taste if needed. 10. 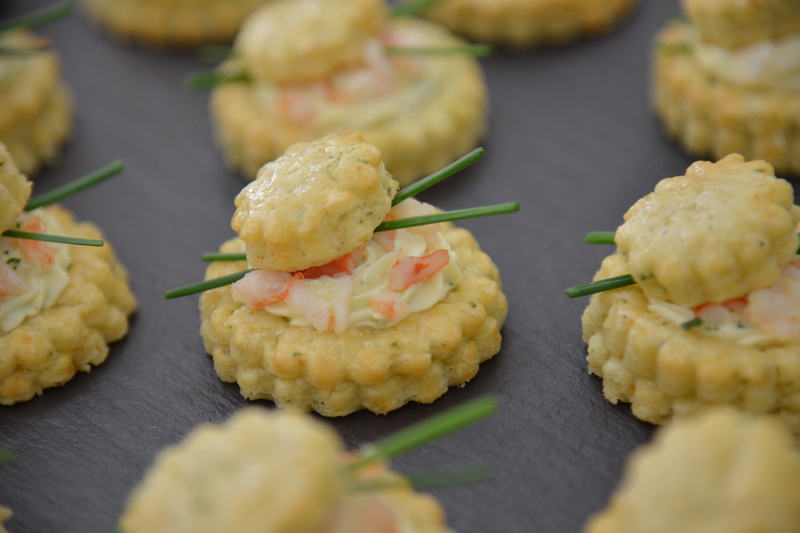 Spoon or pipe filling into baked pastry, top with finely chopped pieces of shrimp, a small dallop of additional filling, then top with two chives placed horizontally and small pastry topper. 1. Make a quick puff pastry by placing flour, salt, and cold butter into large bowl. Cut dough with pastry cutter until blended but medium sized butter chunks remain. Pour cold water of top, combine, and let rest for 5 minutes. 2. Pour dough out onto counter and shape into rectangle. Using bench scraper fold right side in, then overlap left side on top. Rotate 90º-seam side to back, and then roll into rectangle (dough will be rough at this point). Repeat 4 more times then place dough into refrigerator to rest for 20 minutes. 3. Prepare the filling: Cut onion into thin slices then caramelize in butter. Chop dates into small pieces. Chop prosciutto. Set aside. 4. Remove dough from refrigerator and cut into 18 – 2" squares. Fold each square into a triangle then make a small cut at the bottom mimicking the triangular shape on the left and right sides, leaving the top tip uncut. 5. Open triangle, brush with egg wash, then layer prosciutto, caramelized onions, then dates on top. Fold left thin strip of cut triangle onto middle, then overlap with right thin strip of triangle to create diamond shape. 6. Bake at 375º F / 190º C for 20-25 minutes or until golden brown.